Coconut is held in very high esteem in religious ceremonies as it is considered to be a sacred food. Coconut is an essential ingredient of South Indian cookery, especially in coastal cuisine. It consists of an outer husk, a middle hard shell, an inner sweet kernel and coconut water. The kernel is the white and firm edible portion and fresh coconut contains around 440 calories per 100g. Coconut is a rich source of fat, also has protein, fibre and minerals. It is a relatively poor source of vitamin E that most other nuts provide. Fresh coconut can be eaten raw or used for the preparation of curries, salads etc. The milk of fresh coconut is used as an accompaniment to dishes like appam and is used in gravies extensively. Dried kernel or copra is used for cooking and has more calories and fat when compared to fresh coconut. Both fresh and dry coconut should be used in minimal quantity in the diet. Coconut water is a refreshing and hygienic beverage consumed across the world. The main advantage of coconut water is - it has few calories and supplies the body with essential minerals. 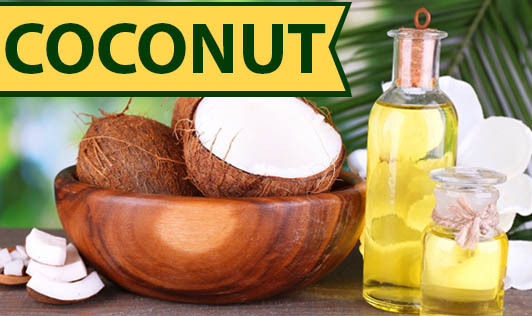 Coconut oil is used as hair oil in all parts of our country. It is also used in the manufacture of confectionery and margarine. The oil is high in saturated fat but is easily digestible. It can be useful for people suffering from digestive disorders who have difficulty absorbing most other dietary fats. Coconut oil does not contain cholesterol.